[SatNews] This is only the fifth organization that is licensed to provide high-resolution space-based imagery of Earth. After much anticipation, Skybox Imaging (NSG: SKYB) of Mountain View, California today launched the company’s first satellite (SkySat-1) into orbit. The success of this launch on a Russian Dnepr vehicle led NSG Analysts to improve Skybox’s ranking from #12 to #7 on the NSG 100 index. With SkySat-1 achieving correct orbit, SKYB returned to the top 10 privately-held companies on NSG’s core index. The launch also included payloads from 1st Tier NSG 100 Planet Labs (NSG: COS) of San Francisco, California and 1st Tier NSG OTB SpaceQuest USA (NSG: SQL). Spaceflight, Inc. (NSG: SFS) and Innovative Space Logistics BV (NSG: ISIS) of the Netherlands, also announced successful payload integration of its multiple SmallSat customers of the NSG 1st Vertical involved in today’s launch. 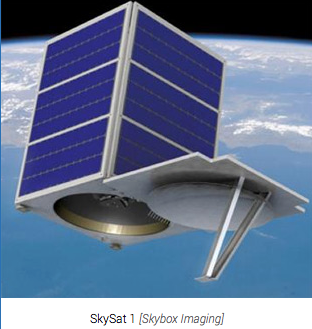 SkySat-1 is a commercial Earth observation satellite by Skybox Imaging, licensed to collect high resolution panchromatic and multispectral images of the Earth. The satellite will operate in a polar inclined, circular orbit at approximately 450 km above the earth. For later launches, Skybox reportedly has an agreement with Virgin Galactic to use the LauncherOne rocket.